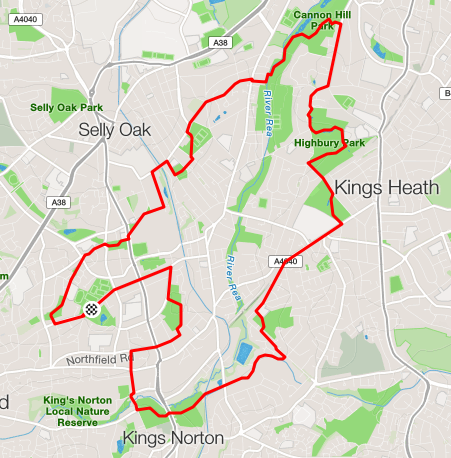 Why not spend your Sunday morning in the company of fellow Harriers as we head out for a run along an autumnal 11 mile route (it’s possible to shorten this by missing either Woodlands Park or Cannon Hill). We will be visiting the parks of South Birmingham, including Woodlands, Bournville, Selly Park, Cannon Hill, Highbury, Kings Heath, Dawberry Fields, Kings Norton and Cotteridge Parks. Start and Finish at Rowheath Pavilion, where we may also refuel afterwards. Starting at 10am so be there for 9:50am please. All are welcome. For those of who with access to Strava, the route can be found HERE. This entry was posted in Social by BvH Admin. Bookmark the permalink.